What is Solution Focus (SF)? 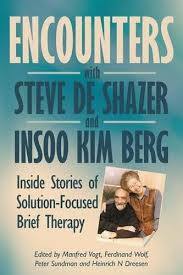 The SF approach was initially developed beginning in the late 70ies by Insoo Kim Berg, Steve de Shazer and their team at the Brief Family Therapy Center in Milwaukee (USA). By observing therapy sessions over the course of several years, they inductively incorporated activities related to clients’ report of progress in a step by step process and left everything else away. Since then many Solution Focused practitioners around the world have been developing the approach further in this way. The Solution Focused approach can therefore be seen as a collection of successful activities to a “good” life. Instead of analyzing problems this approach offers a faster and more future oriented way. People applying this approach focus on their preferred future, on what already works towards this preferred future, on their resources, and on signs of progress. As an interactional approach SF has successfully been applied to many other fields outside therapy like coaching, social work, supervision, consulting, management, leadership, education amongst others and is becoming more and more internationally renowned. Get to know some of the SF networks that we are in regular contact that spread and support the development of the Solution Focused approach! Want your Solution Focused network on our website too? Contact us and let us know!